Miss Sadie, the Cowboy and I were out and about in the woods when we met one of the Summer Visitors. I have no idea what kind of ghostly moth it was that perched on the goosefoot maple, but coming upon it in the shady woods was akin to a spiritual experience and I thought you should have its portrait. 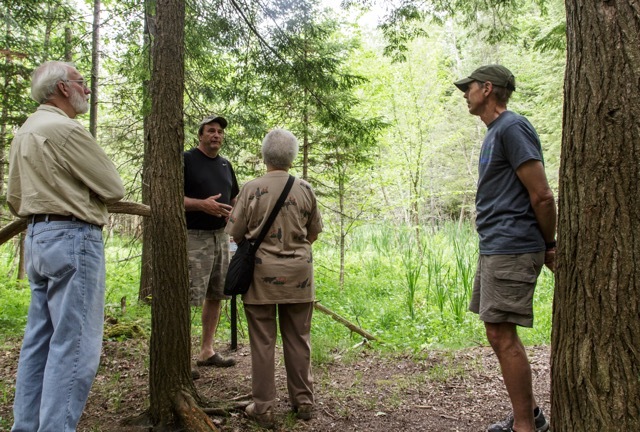 Later that same day Babs Young and I went to the Antrim Conservation District Open House. 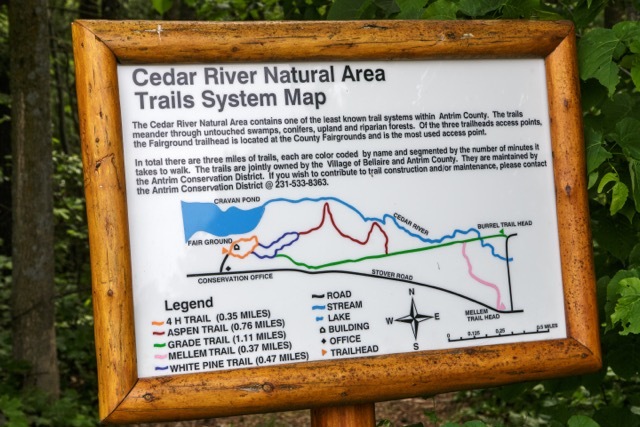 Forester Mike Meriwether took everyone out on the Cedar River Natural Area trail system. As always, Babs took good pictures. I spent most of my time asking questions and took the one of the giraffes. Well I think they looked like giraffes. If you click on a photo you get a bigger one. If that helps you identify the pretty fungus I’d be grateful. One of the benefits of the trail walk was running into some people I hadn’t seen for awhile. Bellaire historian Betty Hoover was there with her daughter, and I’m glad to report that she still has the world’s greatest smile. Bob Haack was there, too, and updated me on the chestnut orchard. The harsh winters killed three rows of his beloved trees, but he and Sheridan have moved up here to stay, and he says he’ll be out there every day babying the rest. More about the chestnuts (and the walnuts and the heartnuts) sometime soon. On our way home, we stopped in Central Lake to admire the glorious garden Patti Bravard is restoring. Those California poppies? Patti’s great-grandmother brought them with her when she migrated to Antrim County from California early in the last century. I couldn’t have left them behind either. Again, Babs took pictures and I collected words. Patti must take after her grandmother. She lived in Paris for 15 years before moving back to Central Lake. As you can see, we had a good time telling stories. Will there be more about her adventures in a future post? Oh yes. The little moth looks like an angel to me. Love the poppies, too. “Giraffes” took me a couple seconds to get. I hope you will follow up on the chestnut story. I only know one farm over this way — no, two — with chestnuts, but even the inedible horse chestnuts are beautiful, especially in bloom (trees, not nuts, of course, in bloom). It took me a couple minutes to decide they were giraffes, too – might’ve been heffalumps or something. I’m looking forward to the next chapter of the chestnut/heartnut story myself. It might be delicious. The heffalumps were good but the poppies were better. The moth was exciting. Oh good. Babs made the best picture but I made the most exciting one! love, love, love the pictures. I loved them all, but the giraffes made me laugh. They also kind of look like a couple big cats with their heads stuck in the bark. Anyway, reading your posts and viewing the pictures is always like reading a very fun book. After all the bad news I read online, it makes me think that there really is a goodness out there. Thank you for sharing your stories. You warm the cockles of my little heart. Every now and then I let loose with a rant, but I try to avoid it. We must thank all the long-suffering denizens of Antrim County for sharing their stories with me so that I can tell them to you. Thanks folks! It’s all beautiful. I don’t know why I thought all the chestnut trees had died in some sort of tree plague years ago. I like your giraffes. Thank you. I can’t resist the giraffes myself. Bob Haack explained that the cultivated chestnut orchards rely on grafting and a combination of trees, including some Asian imports – Japanese I think, but I forget the details. Michigan State’s Ag Extension page says Michigan is the national leader in commercial chestnuts. I’ll be out there learning all about it again – stay tuned! What an adorable photo at the end. Why thank you Martha. Patti and I were having a very good laugh at our own expense. We must continue telling each other stories. I do believe your moth is the one called “Pale Beauty” (Campaea perlata.) You can see several of them here, including a couple that were collected in Michigan. I was introduced to Bug Guide after I became interested in wildflowers. There are, after all, a whole lot on bugs on flowers. Even after reading all the comments about the giraffes, I still see them as a particular sort of Texas chainsaw sculpture. There are dozens — probably hundreds — of chairs that have been carved out of the stumps left by felled trees. it’s pretty magical to come across a hewn chair in the middle of nowhere. On the other hand, the chair seats usually aren’t so humped: so there’s that. Thank you very much for the Bug Guide link. Once upon a time I had quite a collection of useful go-to ID sources, but between losing computer drives and files and parts of my mind I have some rebuilding to do. I believe you’re right about the Pale Beauty. Chainsaw sculpture is a popular pastime in Michigan, too, although we run to bears and trout and eagles rather than chairs. The chairs would be quite useful. The giraffes actually grew that way. The tall trunks go straight up to a leafy canopy, of course – no cunning little giraffe faces or anything – but the humpy parts were the trees’ adaptations to the vicissitudes of life in the wooded wetlands. Someday I’ll have to unearth my photos from hikes in the Upper Peninsula. There are trees up there that have bridged themselves from one rockpile to another. Astonishing things, trees. Heffalumps were introduced into this country in1926 by a small boy named Christopher Robin and have become quite wide spread. Your picture is evidently a giraffe-heffalump hybrid (a giraffalump?) Down in my part of the world heffalumps are called ‘otunts’ by small, tow-headed girls with blue eyes. . . That picture reminds me of the Native American practice of marking trails by bending saplings over and tying them with thongs so they grow zigzagged. The moth picture is wonderful. Gorgeous moth. I’m stealing the photo and making a puzzle from it on Jigsaw Planet. What bliss. “Regular” poppies are red, but California poppies are orange! How left coast of them. I am allergic to poppies. Can’t eat poppy seeds, or anything made from them, like hydrocodone, fentanyl, oxycontin or other such . . . . . Makes me itch like crazy and talk to people who aren’t there. . . . This is what I love about blogging. Sometimes people send me wonderful comments like this one! I’m going to go look at the jigsaw link and come back. OK, I’m back. I had no idea there were such things. It’s a very clever idea and I can certainly see the appeal, but if I put puzzles together online my whole day would disappear and the dogs would be throwing things at the door as a “hint.” (Just to give you an idea, I spent nearly ten minutes working on the moth puzzle you made and didn’t even locate all the edge pieces. I am hopeless at this.) Love the idea, not gonna do it. Forgot to address the poppies. You sent me off to do research. The California Poppy (Eschscholzia californica) is definitely bright orange, which I remember clearly from my first visit to California to see my cousin Stan. I was enchanted with the wild orange poppies that filled the meadow behind their house. Stan looked at me with disbelief. “Those are just ol’ weeds!” Boys. I don’t remember what color the centers of those poppies were, but the ones at Patti’s house are clearly black, leaving me to conclude that they are heirloom poppies from California but not necessarily “California Poppies,” which all reliable sources online are telling me have yellow/orange centers. Begging the question of what kind of poppies these are. There are many, many gardens filled with poppies Around Here. I don’t think I’ll be nibbling on the seeds from any of them anytime soon. California poppies are a recurring trope in the fantasies of the Hollywood-dwelling, Michigan-summering L. Frank Baum. (Margaret Hamilton cackle-croon: “Paaaaa-AAA-aaah-peees….”) And those giraffes. In the, ahem, reality-based community, scientists are studying the communication patterns of trees (and other flora). One of my students, a young man from Nigeria who knows his flora, did a fascinating project on the topic last winter. About the giraffalumps. I am working on a post about trail trees and the growth patterns of trees right here in the neighborhood and would be quite interested in your student’s project on the communication patterns of trees. I don’t know whether trees communicate with each other or not, but they certainly do adapt to all kinds of environmental stresses, from erosion to high winds to drought to infestations of insects or fungi. Some of those adaptations can appear intentional, and I anthropomorphize trees all the time. I’ll see you later this month. We can tour the reality-based community. Heffalumps and woozles! A favorite from my daughters’ childhood. Love the idea of the giraffalump hybrid, lol. I have a couple bright orange poppies growing among my mostly pink and purple flowers, they are my crazy aliens – especially if you consider the poppy bud! Alien indeed! Poppy buds must be a cousin of the sunflower Triffids! I’m OK with heffalumps but watch out for the Triffids !